After sitting in your office chair for a long period of time your body stiffens up. After you stretch your body, you always feel so much better. This is because stretching helps to take some pressure off your body’s joints that are constantly in use. Can you believe that ‘stretching” those joints sends amazing signals to your brain? 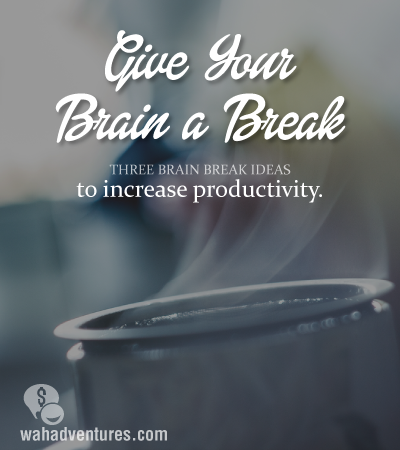 In essence, your brain is getting refreshed and rejuvenated. When your body moves and gets stimulation, it helps to increase the function of your brain in a positive way. Because your brain is getting positive stimulation, you are also helping your body to prevent long term diseases and helping to keep your brain cells from going to waste. If you’re looking for another excuse to fill that coffee cup then consider the benefits moderate coffee drinkers are known to have. Studies show that small amounts of caffeine may be improving your focus, abstract thinking, memory, productivity and reducing pain. The next time you need to get up and walk away from the computer monitor- don’t feel guilty about heading back to the coffee pot. However, if you are on your 5th or 6th cup- reconsider! Drinking too much coffee can cause muscle tremors, restlessness, increase blood pressure and make you irritable- not exactly conducive to being a productive telecommuter. You can actually increase your memory and mental focus by playing games. Brain games that are created to stimulate and challenge you are helping millions of people around the world keep their minds young and fit. I’m sure you have heard of companies like Lumosity where they have personal trainers for your brain! It’s like joining Planet Fitness for your brain. Completing crossword puzzles, playing chess, solitaire and sudoku games are also great ways to keep your brain mentally challenged and fit. It’s getting close to time for your next Brain Break! I use all of them and I am drinking too much coffee according to my doctor. I drink about 3 talls per day. I’ll miss it at 2pm. And don’t forget going outside and getting some fresh air to rest your eyes!